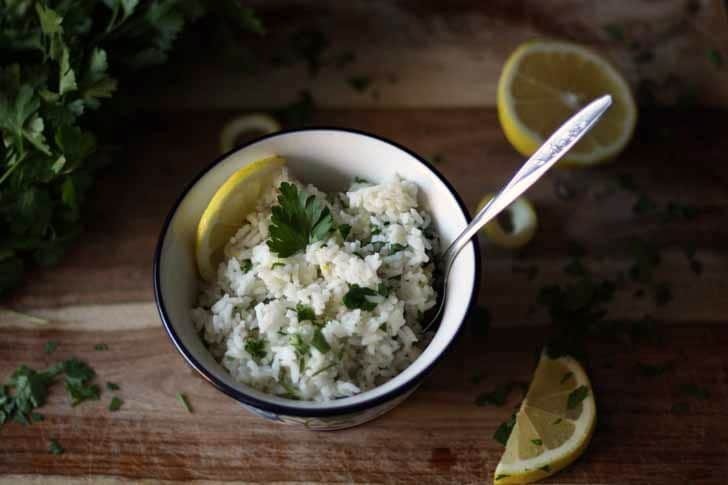 This easy side dish is aromatic and flavorful – pair this lemon parsley rice with broiled chicken or baked tilapia. Sleep is a wonderful thing, until that is all you are doing. I don’t know what’s going on with me, but I have been unable to do anything but sleep since Monday. And all of Monday I slept – day and night. Today I am forcing myself out of bed to share this recipe with you and catch up on my email. Sooo many emails. (affiliate link). It’s actually a pretty big cookbook, so I guess I should say one big thing. I don’t have the most recent version but all of the recipes it includes are in the more recent volumes. I have found some great recipes in it over the last few weeks – my creativity without sleep only allows me to modify recipes. My usual go to starch is pasta, as you can tell by looking at many of my recipe choices. I occasionally eat rice, but I do find it to be a little boring. Most of the time, unless its fried rice, you just have plain boring white or brown rice. Little flavor but you’re full because of the starchiness. 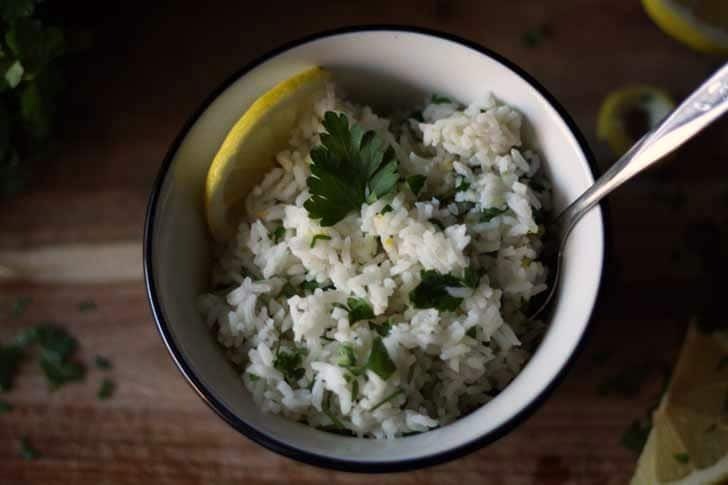 When I came across a recipe for aromatic rice in the cookbook, I was sold. Right off the bat, I knew I would like it because it was cooked in partial chicken broth. That HAD to make the rice taste less boring. 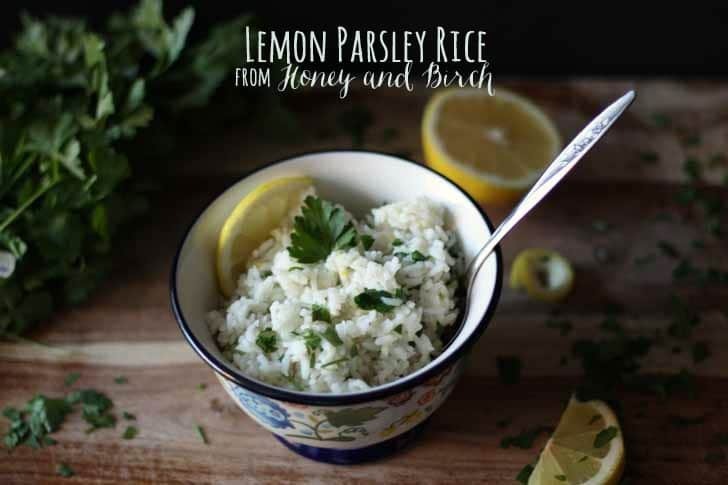 I used my rice cooker to make it even an easier side – nothing quite like chopping up some herbs and grating some lemon peel to spruce up a boring dish. Prepare your rice per the package, substituting 1 cup of water for chicken broth. I used my rice cooker - if you use this method, remove the rice from the slow cooker immediately upon finish to prevent burning. 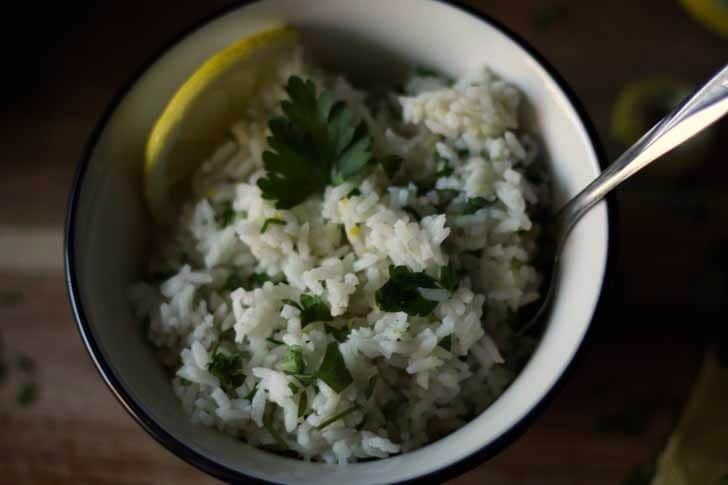 In a bowl, combine the cooked rice, salt, parsley, lemon peel and lemon juice well. Serve. Sounds good..never tried it with tilapia before! I love rice dishes and would love to try this. Thanks! I do eat rice because it makes me feel fuller faster, but I’m totally bereft of ideas on how to make it less bland but still kinda light & airy. This recipe’s a keeper. This looks great. 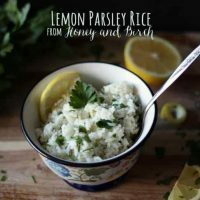 I don’t think I have ever had rice with lemon but must give it wonderful taste and the parsley too. This sounds lovely, thank you very much for sharing.